[By Nick, New for 2014] When we first received word about the new Ben & Jerry’s core flavors, I immediately called dibs on this one. There are a various reasons why I wanted to review this flavor but one stands out the most. Unlike the other cores, this one doesn’t involve their lackluster chocolate base which I complain about in every review. I mean, come on, why did they have to use the chocolate in 3 out of the 4? At least one could’ve used their milk chocolate from Peanut Butter World or even the vanilla bean from the recently departed Late Night Snack. Speaking of that, I find it funny how this flavor is comprised of components from flavors that have been sent to the graveyard. You have the sweet cream base found in both Imagine Whirled Peace and Chocolate Nougat Crunch, the salted caramel from Late Night Snack and the blondies from Maple Blondie (I know they’re back in Rockin’ Blondies but just go along with it) It’s as if Ben & Jerry’s pulled a Subway and took ingredients they already had on hand to produce a new product. Honestly though, I thoroughly enjoy all of those components so I’m rather excited to try this flavor. There’s only so much that can go wrong when blondies and salted caramel are involved. Things are look good from the beginning. While not fully centered, I can see more of the core this time. That and there are bits of blondies everywhere which is always a good thing. Let’s start with the pros first. The sweet cream base is just how I remember it. It’s not going to blow your mind but there’s something satisfying about its simplicity. I honestly prefer it over their regular vanilla base just for that reason. The blondies, while not as big as in Rockin’ Blondies, the little bits are everywhere. Their size hinders their textural impact but not their flavor. The buttery brown sugar melds perfectly with the sweet cream base. This would be a solid flavor as is but Ben & Jerry’s had to add the core. This is where the cons begin. While not bad in very small doses, the core is way too salty. A little goes a long way with this one. I made the stupid decision to try the core alone and needed to get a drink of water afterwards. All you get is salt, salt, slight butteriness which is rounded out with some more salt. Salted caramel should be just that caramel with salt. What we have here is salt with a hint of caramel. I’m having the complete opposite experience here than what I did with Karamel Sutra. While I wanted to just eat the core, I want to eat everything but it here. It’s disappointing too because this is a very good flavor otherwise. Ben & Jerry’s would’ve been better off either using that core again for this one or using the salted caramel but incorporating it as a swirl so it’s not so concentrated. For a comparison, Karamel Sutra contains 70mg of sodium per serving while Salted Caramel comes in at 180mg per serving. That’s more than 2.5 times more sodium in a serving. All I can say is what the heck is going on with these cores? I didn’t get to try their original core lineup in 2002 but I think I know why they failed. We only have one more core flavor left to review so here’s hoping that there will be a saving grace to this line. Verdict? Way too salty to properly enjoy. Buy Again? If I feel like dehydrating myself with ice cream. Out of all the core flavors this is the one I was most excited to try. You are so right regarding the salt; way too much! I too like this base a lot but even that wasn't enough to balance all that sodium. Lesson learned; wait to buy until I read the review! That's why I love this site. I would probably love this one, then, because I sometimes add salt to plain vanilla ice cream. I love the sweet and salty combination. Potatoes aren't needed in the ice cream to accomplish this effect. You said that this flavor contains components of recently departed flavors. Don't forget that this is what B&J's does. They bring back the same components of buried flavors and create new recipes. 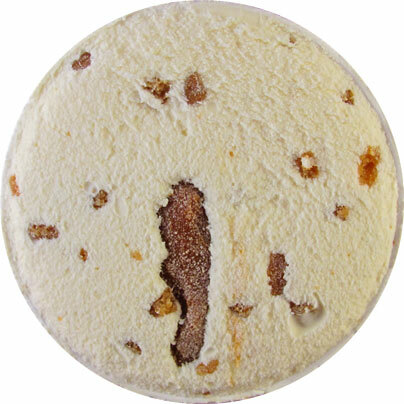 Holy Cannoli was buried but came back in a different version last year, as Cannoli, for a limited time. Further, you mentioned "recently departed Late Night Snack". Was this buried? My grocery store still carries it and my nearest Foods also carries Imagine Whirled Peace, yet you speak of them as if they are buried. Are they going to be buried in the near future? Anon, yeah I was excited too but the core just ruined things. Stride, adding salt to ice cream is different than what we have here. It's like they spilt the whole shaker into that core. I see what you're saying but Holy Cannoli and Cannoli were two completely different flavors. Similar name but the compositions weren't all the close. Those flavors I mentioned except Maple Blondie were retired this year and should be disappearing off shelves soon enough. I .... am intrigued! Most "salted" caramel things are just .... caramel, and I never can get ENOUGH salt .... so I will be tracking this flavor down! LM, there's more than enough salt to go around with this one. Be sure to let us know what you think! I, too, always wait to purchase new and different ice creams until I read this site. You guys rule! Keep up the great work. Anon, it's comments like your that truly make me enjoy what I'm doing here. Thank you for the support and hopefully our reviews will keep on benefiting you! I actually RETURNED this pint. Not sure I've ever done that, except with maybe a freezerburned one...The blondies are so tiny, and why? They had those great big chunks on hand from Rockin' (the only good component of THAT pint), and it's like they minced them up into nothingness. The base and blondies come off as a budget ice cream because of this :( The salted caramel swirl, excellent texture, but that taste was not right. And I LOVE me some salty, salty caramel. Sigh. Anon, if I was an everyday person and not and ice cream review, I would've taken it a step further and complained to B&J's about that core. It just ruined any shot this flavor had. Well, Here I am ... reporting back-- and frankly, I didn't find the Caramel too salty!! however, I DID find the ice cream and blondes... a tad too sweet !!!! 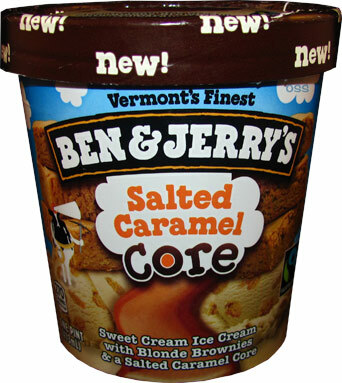 I only can handle this pint in very small doses :) SO for all you SALTED caramel lovers out there.. this is worth trying. LM, aha to each their own. This is why you don't go on our reviews alone when deciding on trying a flavor. Just because I don't like something doesn't mean another person won't love it. I'm glad you enjoyed it though! I love this flavor! The perfect amount of flavor! I recommend it! So Glad! You Love! The Flavor! @Anon, I feel your excessive use of exclamation points is caused by how dehydrated the core made you. I don't know if you have ever had "eel sauce", or that syrupy, slightly sweet, soy sauce that sometimes is put on sushi, but the core of this ice cream is a dead ringer...more than a little off putting. Anon, no I haven't but that just grossed me out by the thought of it being similar to the core. OK, I just tried this. I feel like I'm the target audience. Love sweet cream vanilla, blondies, and salted caramel. I liked the ice cream, but the core really ruined it for me. It wasn't the salt - that I liked - but the ratio of core to ice cream just doesn't work. Way too much core - it overwhelmed everything else. We ended up eating around the core and throwing it away. Turns out the concept doesn't work. For me, anyway. Anon, Totally agree with you. It's not that its too salty, there's just too much of it making it a salt bomb. There is a scoop shop exclusive that uses a swirl (like I suggested in my review) that I might give a try sometime in the future though. This is my favorite ice cream flavor ever. It also seems to be the only Ben & Jerry's flavor that is constantly sold out in my local grocery stores. I recently had to use B&J's thrifty "Flavor Locator" to find a pint of it when I just couldn't curb my craving for it. I recommend this flavor to all of my family members and friends and they all come back with rave reviews as well. As far as the core being overwhelming, I try to get a bit of the core in each spoonful of ice cream, but never just a spoonful of core. My husband, however, enjoys a spoonful of core with just a small amount of ice cream. Even my infant enjoys a little taste of the caramel core. This flavor is definitely a family favorite. Yes, the salt in the core could use a bit of moderation, but as it is, I'm going to take it as a safeguard against people like me, who'd gobble the pint up in one round otherwise. This flavor is two thumbs up from me. @Aron, thank you for the thorough comment, but please keep in mind that people ("amateurs") have varying levels of salt sensitivity, much like people have varying levels of sugar sensitivity. we are all different! Aron, I apologize for my amateur taste buds. To answer someone's comment about why no chocolate in the salted caramel core, some people are allergic to chocolate. Not too many of Ben and Jerry's flavors with no chocolate. Sure I can have strawberry and butter pecan, and boring vanilla but I love Ben and Jerry's Salted Caramel Core which is a substitute for chocolate for me. And I am salt sensitive but find the core mixed with the creamy is a good blend and I don't notice the salt too much. I'm also a big fan of this flavor. Yeah, in certain bites the salt can be a bit of a punch in the face, but I like salty things this so wasn't a turn-off for me. There is a HUGE difference between salted caramel and salty caramel... I love salted caramel but this is just plain salty... The ice cream itself is good but I find I'm eating around the core its just that bad. I liked their hazelnut core one but I won't even buy this one again. That's how ya do it....I LOVE IT! Currently eating mine.... FOR BREAKFAST! 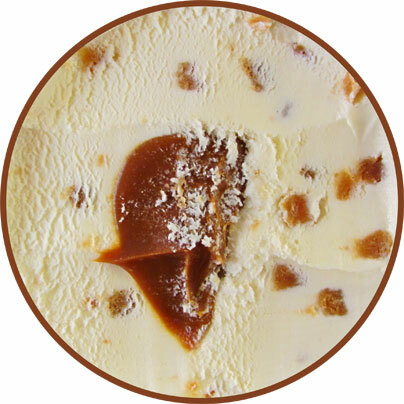 I just ate half a pint of B&J's Saltaed Caramel Core and LOVED the saltiness of the core. I was so disappointed when the core faded out halfway down the pint. Whut up with that? After that actually sprinkled a little salt on the ice cream to compensate for the n=missing core. I think the core is just the right amount of saltiness when mixed with the surrounding ice cream. But MAKE THE CORE REACH TO THE BOTTOM PLEASE!